Limited Edition of 100 copies. Comes in a 8" x 8" sticker cover. Illustration by Spek The Architek. 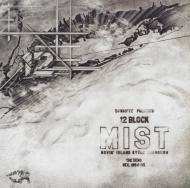 12 Block consists of DJ Nastee (of Terror Green fame), A. Math, & Taste The Terror (Hard 2 Obtain).